Want to learn about Git and GitHub? It can save you hours of frustration by versioning your code and making it very easy to roll it back to an early date, or even create temporary branches where you can make major changes, and only merge them into the main code base once you’re sure nothing will break. Despite its usefulness, however, the initial learning curve puts off some people. It can be a little difficult to wrap your head around if you’re not already familiar with the concept of version control. That’s where Try Git comes in. 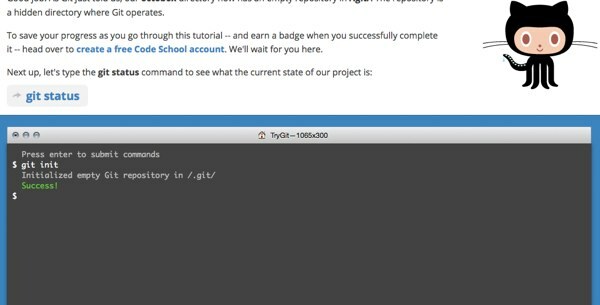 It aims to teach you the basics of Git with an interactive tutorial that features an in-browser command prompt. The tutorial walks you through different commands, and helps you see how everything works. If you’re not using Git yet, check it out! And keep in mind that there are alternatives to GitHub if you don’t want to host your code publicly. You can use Git locally, on your own server, or a service like BitBucket that doesn’t charge for private repositories.